Cindy, I'm sorry about Artie, it's hurt me when I read your story about his pain, he is in a better place now. I hope G will settle down soon with you. 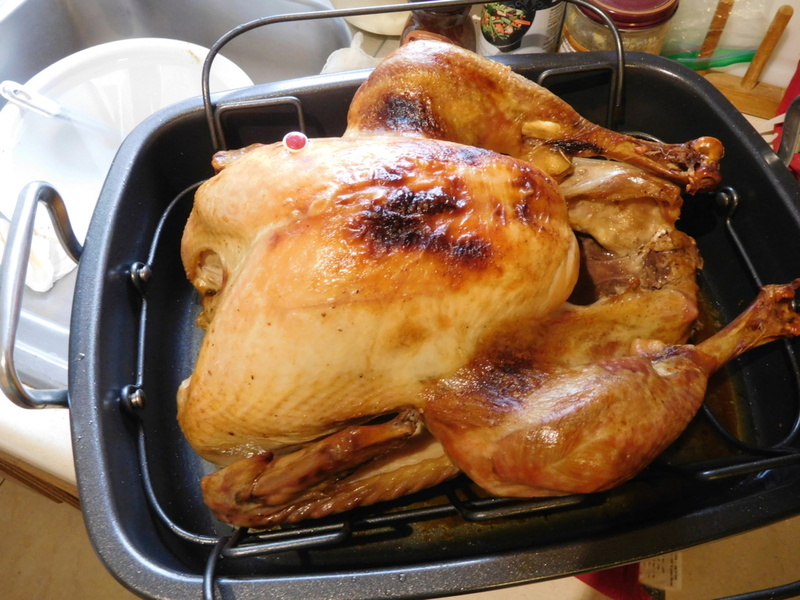 This year, I'm cooking turkey, my Mom in-law let me doing it, she is making mashed potato and sweet potato, I'm doing the turkey and the stuffing, my sister in-law is doing green beans and salad, we invited a lady from our church, she is alone and has nobody on this day, she is making some rice dish. 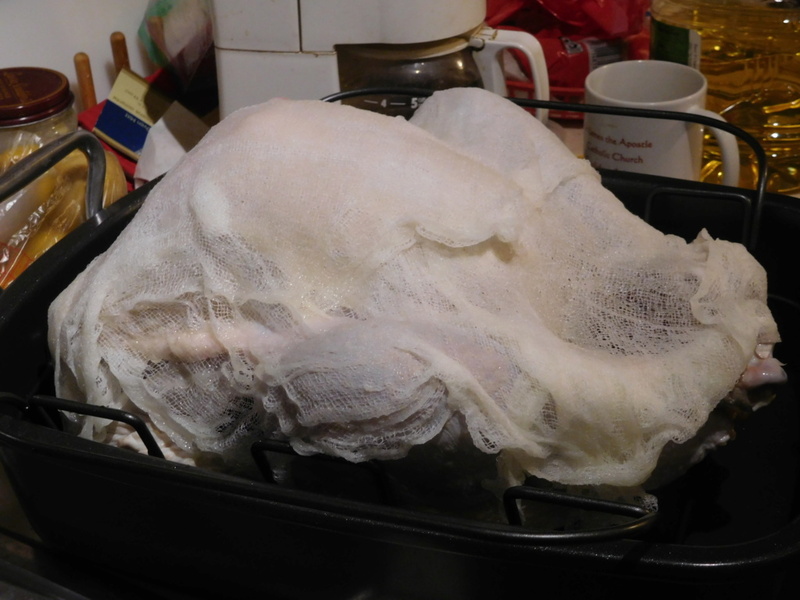 I'm thawing my turkey now, tomorrow I'm going to brine it, on Thursday morning I'm going to roast it like the way my MIL did, cover the turkey with oil soaked cloth. 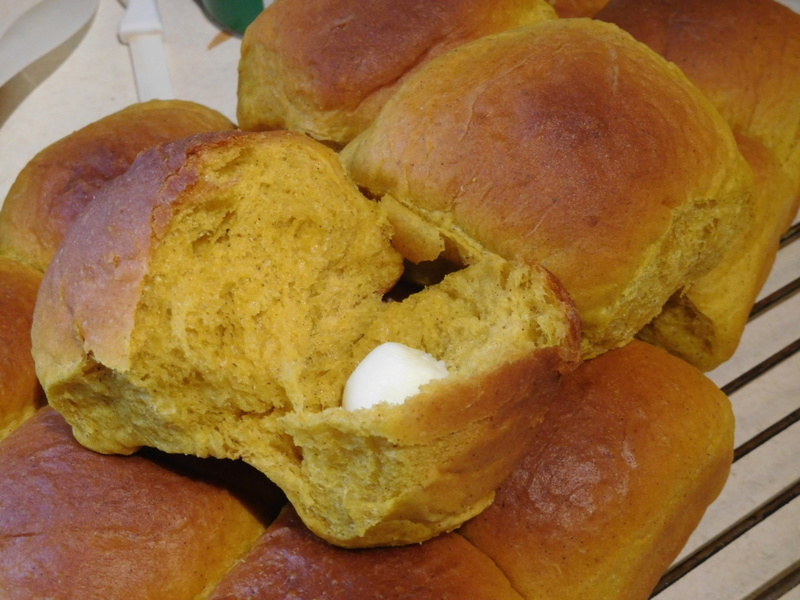 I'm going to bake the stuffing separately, it will be my first too, I read the recipe, it calls for dry bread, I was wondering if I should toast the bread cubes first or just let them dry in fridge, any suggestion? I'm not a big fan of stuffing, my MIL cooked it inside the turkey, this time I'm also adding some sausage, so we'll see how it turn out. Imelda, I'm sure your dressing (what I call it when it's in a casserole dish cooked outside the turkey) will be delicious. I would cut the bread cubes and just let them sit on the countertop overnight. You could toast them in the oven if you want them brown, but it's not necessary. I use the packaged Pepperidge Farms seasoned cubed bread ~ been using it for years, just like my grandmother before me. I've added cooked sausage before and it's tasty. You can make any additions that sound good to you. For me, I like lots of just barely cooked celery and onion in my stuffing ~ but I have strange tastes so you do what you like. I've put sliced water chestnuts in before for a bit of crunch or pecans and once or twice added chestnuts that I roasted in the oven (Pain in the 'you-know-what' to peel and chop). Tonight I seared and then roasted a small pork tenderloin. Love that I take the time to trim them up when I get the package of two.....take off all the silver skin and trim the ends to make even little roasts. The ends and trimmings get used for sweet & sour pork. Since we aren't going to have company for Thanksgiving this year (our guests had to cancel) it'll just be the two of us. 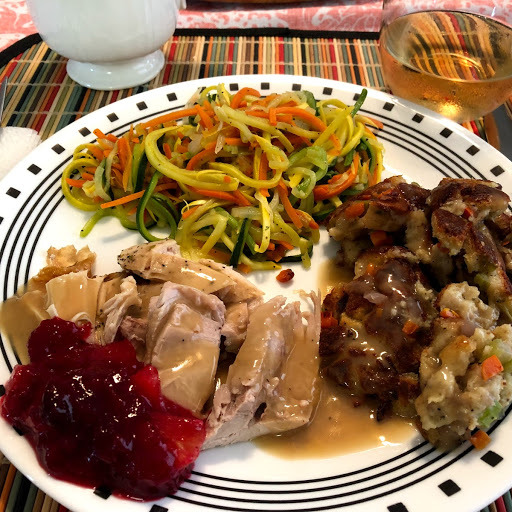 I'm kind of looking forward to roasting the turkey and then having some dressing and just one vegetable ~ I think I've decided on the carrot/green & yellow zucchini/onion 'spaghetti'. No potatoes needed (I will make some gravy). And no dessert because Dane won't eat it and I don't need it. 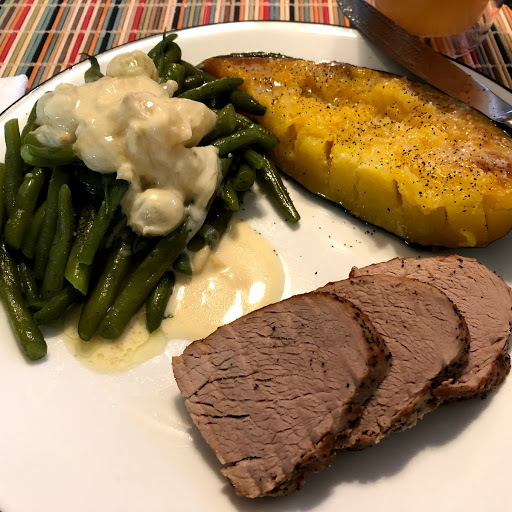 So supper tonight was pork tenderloin, roasted acorn squash and green beans with creamed onions....he won't eat those, either, so I made them just for me. It's an absolutely beautiful day today.......blue skies, a bit of breeze and temperature in the low 70's. perfect. UNCLE JIMMY wrote: That's our Little Girl, Maria. She just loves being on the farm, and working on it. I guess one would call it a Breeding Farm. All special purebred sheep and pigs . Some chickens, but only for the eggs and birds for auction as free roaming. A few steer, but only to use and sell for breeding. The steer are always breaking through somewhere and the police are always calling her or her boyfriend to get them off the road, and get them back into the fenced area. 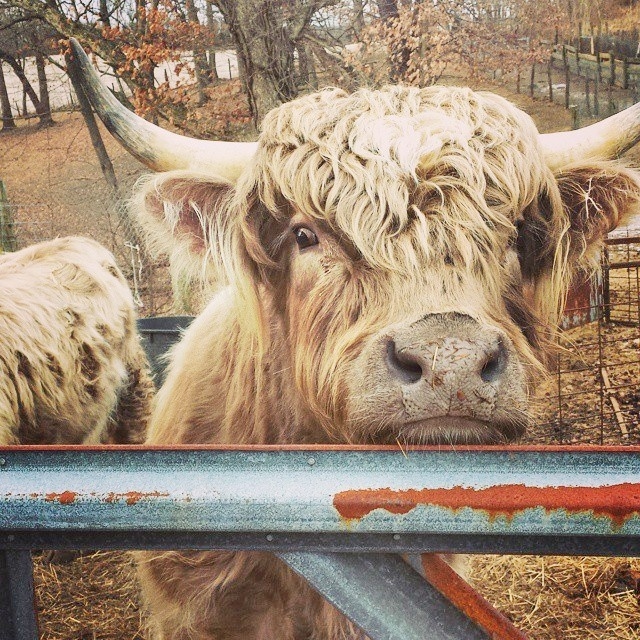 Thanks so much for posting the pics, Jimmy, as I loved seeing them, especially the bull! A farm sure is a lot of work but it sounds like Maria is well suited for it -- you've got to love doing it. I sure wouldn't mind having fresh eggs every once in a while! I often watch that show "Cops" and every so often, you will see a policeman trying to shoo a cow or two out of the street. Seems the cops have learned to just walk towards them making some noise and they will head right back to the broken fenced area where they got out! Geoffrey is adorable, Cindy! 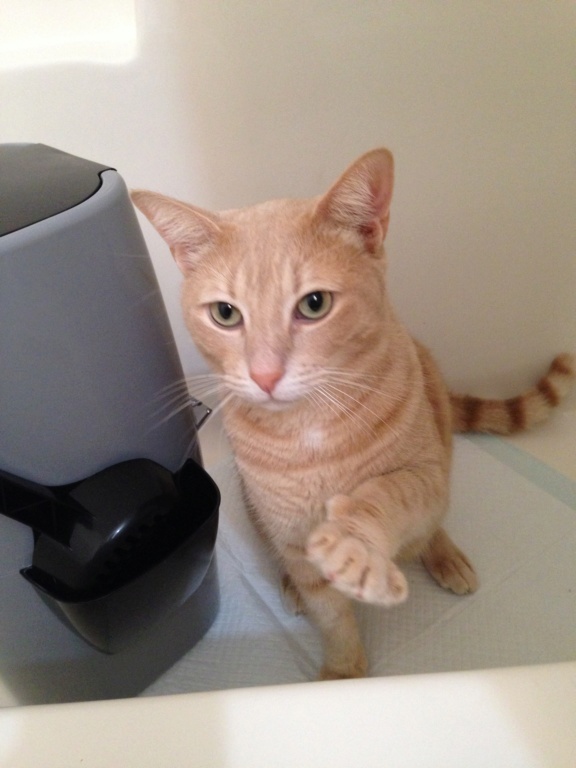 It was definitely time for you to adopt another kitty. I'm sure Geoffrey will get used to being safe and loved given some time. He sure is cute -- and he looks soooo soft, too! Bugster2 wrote: Do any of you own a good toaster? One that toasts evenly on both sides? I've had more toasters in my life and our current one is a loser, too. Brian picked it up at the Naval Base one day and it wasn't my cup of tea but hey, it was a toaster and we needed one. We usually buy a four-slot one. My only good one was an expensive one I paid about $90 for -- can't remember the brand name. It worked like a charm -- all the features, too! -- until it died after about 10 years so we got our money's worth out of it. I'd have replaced it with the same brand but the reviews on the newer ones were terrible. They just don't make a good toaster anymore IMO. Current one worked well for a while, then the bagel feature stopped working so we just toast both sides of the bread when making bagels now, which I've grown to really like. Let us know if you find a good one. I saw on the news many New Orleanians changed the time they serve their regular Thanksgiving meals tomorrow so they could head to the Superdome to see the Saints play the Atlanta Falcons, our bitterest rival, at 7 p.m. We're heading into tomorrow's game on a 9-game winning streak so the town is really getting excited and hoping we can keep winning and get to our second Super Bowl. I probably won't be stopping by these parts tomorrow so I hope all of you have a wonderful Thanksgiving! It has always been my favorite holiday and still is, though I wish I didn't have this back pain to deal with, as I can't last as long enjoying making a big meal like I used to. It's only my brother-in-law coming this year but I'm still making too much food as usual. I'll give Ed lots of food to take home and I will REALLY enjoy having all those leftovers on Friday! 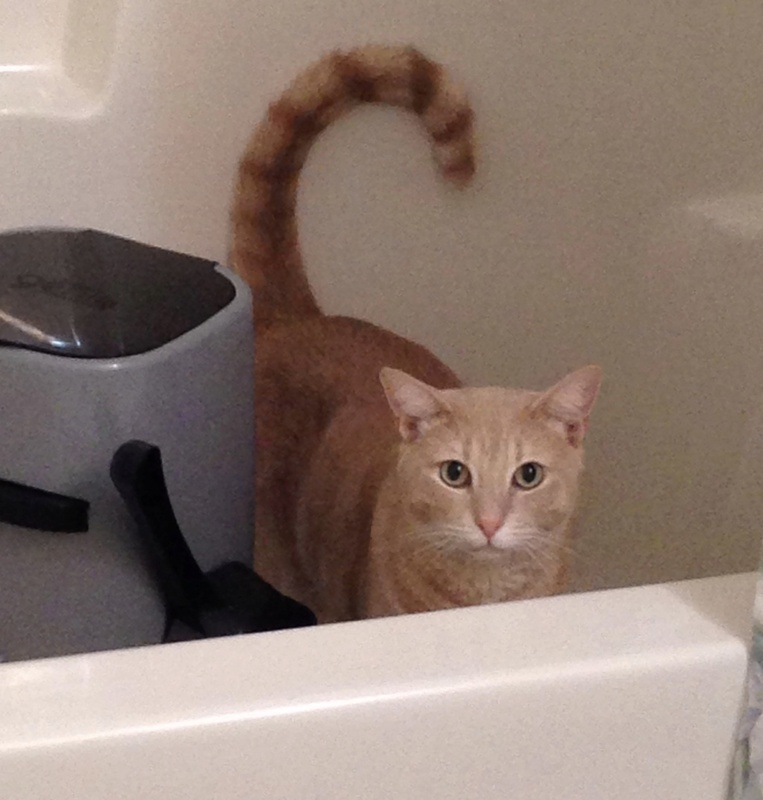 I ended up buying an inexpensive Cuisinart toaster. It does a bang up job in two minutes. Joe is a happy camper. I got my new Wolf countertop oven yesterday. I haven't had time to try it out on anything except toast. Toast took 7 minutes and was brown on top and brown and white bars on the bottom. It was a fine job for an oven but too slow. I can see will will only use it for toast when we have more than two pieces to toast. I am going to use it tomorrow for potatoes and brussel sprouts. We are having a very simple Thanksgiving: turkey stuffing, potatoes, gravy and green beans. No dessert. One of the best toasters I have is from the 1960's. I got it at a thrift store. Almost ready to set off to my cousin's for T-day. It is a very long trip. Nice when I get there, but such a long commute. My contribution, is my usual: 2 pounds of assorted Italian cookies, a bottle of wine, a plant for my aunt, and this year I picked up a package of Trader Joe's Holiday Celebration assorted flavored coffees for their Keurig machine.. Sounds like chintzy gifts but the cookies were $25, the wine was $20, the coffee was $10.. and the plant was negligible. Happy Thanksgiving to Everyone here.. I would rather relax at home... and I may try out my new dishwasher!!! Bugster2 wrote: I ended up buying an inexpensive Cuisinart toaster. It does a bang up job in two minutes. Joe is a happy camper. I got my new Wolf countertop oven yesterday. I haven't had time to try it out on anything except toast. Toast took 7 minutes and was brown on top and brown and white bars on the bottom. It was a fine job for an oven but too slow. I can see will will only use it for toast when we have more than two pieces to toast. I am going to use it tomorrow for potatoes and brussel sprouts. I have had a Cuisinart toaster for many years. I do not use it often.. it is ok.. but does not seem to toast evenly. I have to sometimes put the toast back in, and it is not fast. Hopefully, they improved... but I eat toast so rarely, that it is not important for me to replace it. I have a Cuisinart tabletop convection oven. It works great. I got it because my stove oven was wacky; and they would not replace it..
Now, I have a new stove which, so far, has a great oven. Will find out tomorrow when I make my turkey breast. I am going to be using the oven that came with the house. I haven't used it yet so this will be interesting. I hope it is better that my crappy Dacor I had. This may be the Thanksgiving that isn't. I bought a fresh turkey last week with an expiration date of Nov 27. I opened it this morning and it had started to turn. It wasn't putrid but it was "off". My husband went back to the store to return it. They don't have any more fresh turkeys so he is going to try another store. Wonderful. We had Thanksgiving at my sisters. I took a chocolate pecan pie. Everyone said it was good. 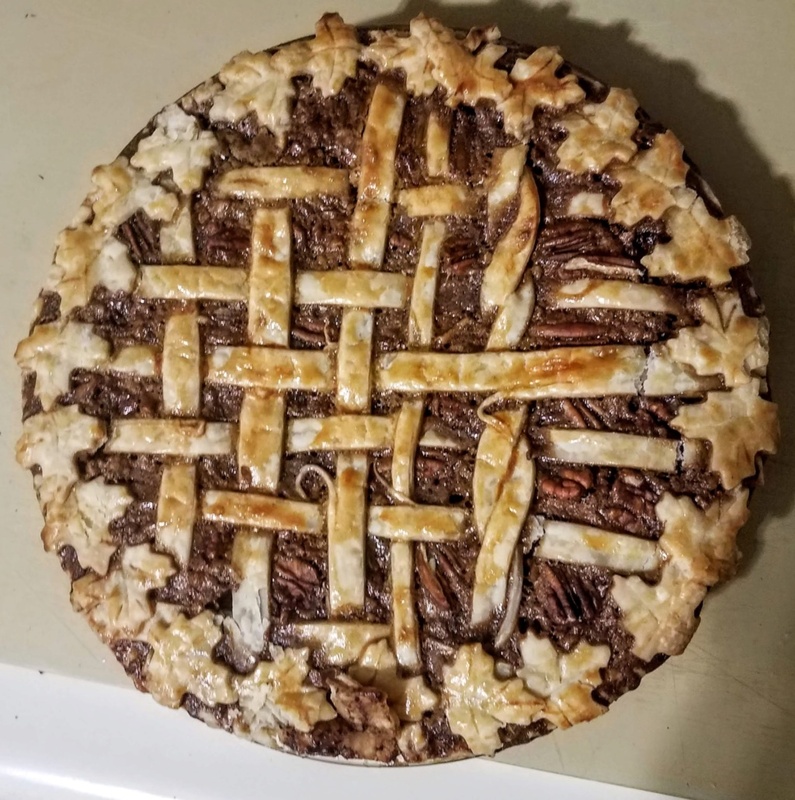 I would describe it as a chocolate pie with a lot of pecans. Tomorrow I will roast a small turkey so we can have some" left overs"
Norm, you did a beautiful job with the crust details. It looks delicious. Thanks Beth. My crust was a lot simpler than the original. I came home and took the turkey breast out of the freezer.. I will roast it on Saturday.. 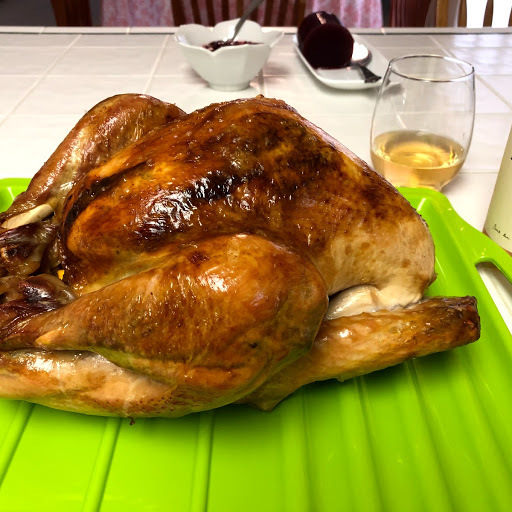 Your turkey looks wonderful! It must have cooked nice and snug under that 'coat' of cheesecloth. 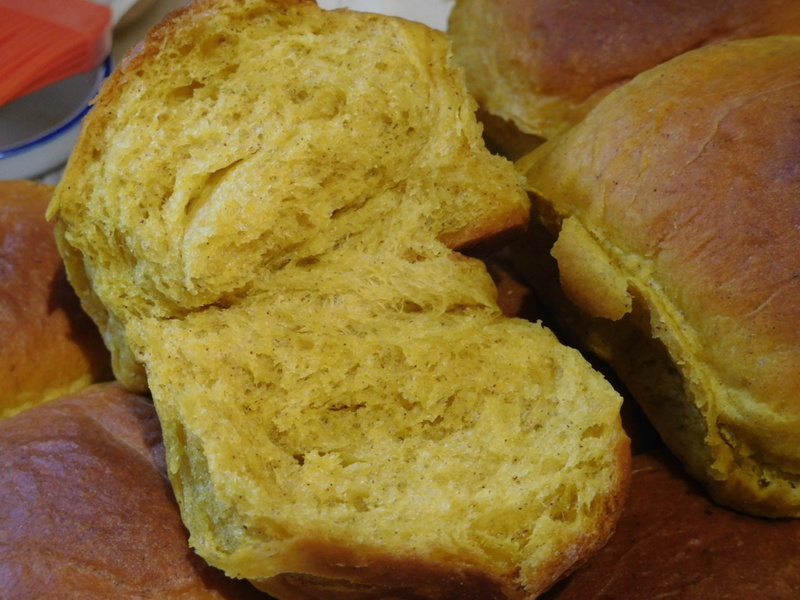 But it's your dinner rolls that have my mouth watering ~ I bet I could eat 1 or 8 of those in a matter of minutes! Yum!!! I had my one and only official 'day after Thanksgiving' cold turkey sandwich for lunch today. One is all I ever want ~ split the small bit of leftover dressing with Dane (we were going to arm wrestle for it but I said rather than let him win, I'd just share it with him.....). 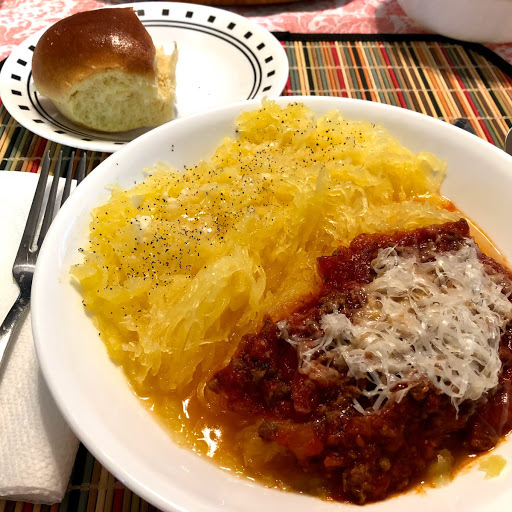 I can't face another turkey dinner tonight so we'll have a spaghetti squash with some marinara. It sounds good to me. Boy Oh Boy.....Everyones Turkey and pies with pecans, squash and pumpkin rolls, yumm! All looks so good! 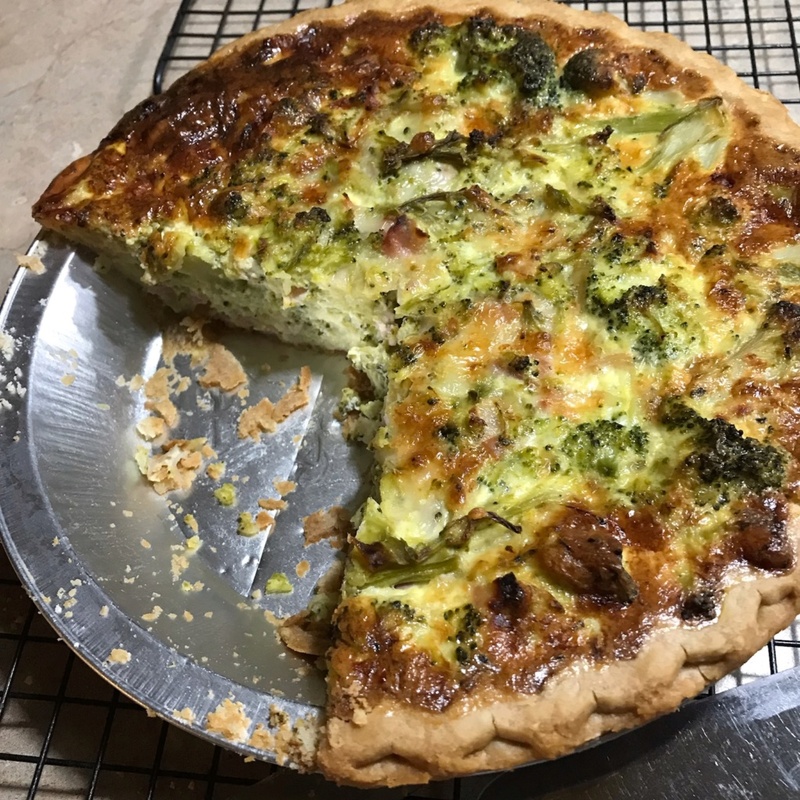 We had leftovers for lunch, and supper, Tina made a broccoli quiche Lorraine. 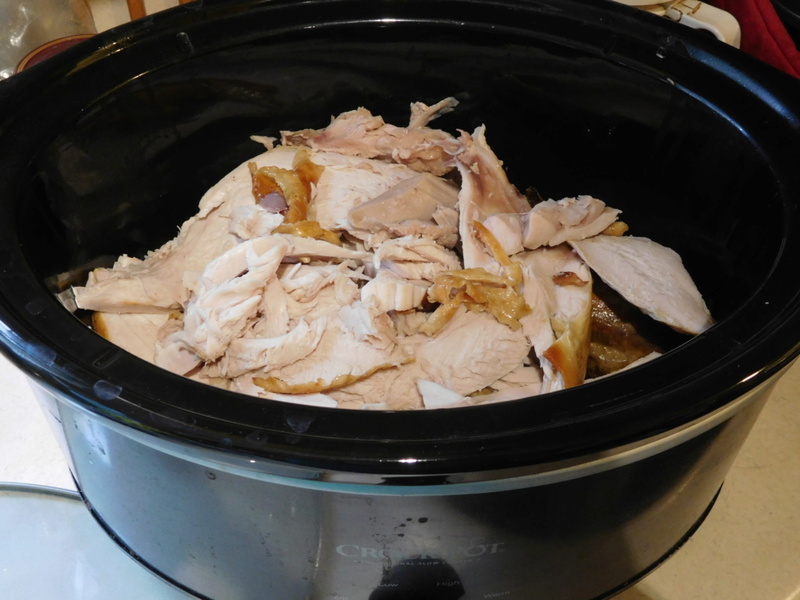 Tina made a huge pot of turkey carcass soup. Son Jimmy took most of it. I don't like it; never did.....Period! The Quiche was nice and firm. Not wet. Not dripping of uncooked egg! (( Debbie )) take note of that! hahahahaha ... You know Jimmy is fussy with his eggs. 251 Re: Welcome November what's cooking!